If you are seeking professional assistance for organizing and hosting your upcoming corporate event, get in touch with us. 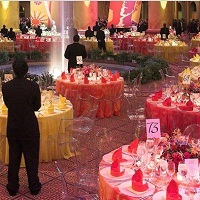 With a decade of experience and domain knowledge, Life Travels Booking is involved in conducting events across the nation, as per the budget, schedule and requirements of the host. With our services, we prepare a budget, reserve the venue, book caterers, arrange accommodation, send invites, etc. In short, we take care of everything from conception to clean up. We are based in Nanded (Maharashtra, India) and can be reached anytime for further discussion.